President Obama lands in Havana for the first official visit to Cuba by an American president after decades of hostility. 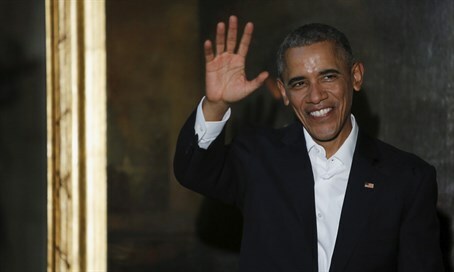 President Barack Obama on Sunday afternoon arrived in Cuba, the first official visit to the country by an American president after decades of hostility. “¿Que bolá Cuba? Just touched down here, looking forward to meeting and hearing directly from the Cuban people,” the President tweeted shortly after his arrival in Havana. Obama will meet Cuban President Raul Castro during his visit, but not retired revolutionary leader Fidel Castro, and the pair will discuss trade and political reform. The president emerged smiling from Air Force One with First Lady Michelle and their daughters Sasha and Malia, according to the BBC. President Obama's visit is the highpoint of a recent easing of ties, which included the opening of embassies last year. Relations between the United States and Cuba were formally restored last July, seven months after Obama and his Castro agreed to restore ties snapped in 1961 during the Cold War. In addition to the reopening of embassies, the United States officially dropped Cuba from its blacklist as a state sponsor of terrorism. Since 2014 there have been commercial deals on telecoms and a scheduled airline service, increased co-operation on law enforcement and environmental protection, noted the BBC.